Pakistani terrorists massacred seven members of the village defence committee (VDC) and their five children at Tiali Katha in Surankot tehsil of Poonch district last night. All the slain persons were Muslims of the small hamlets of Marrah and Dafali that had refused to follow the diktats of terrorists. Ten others, including four women and three children were critically wounded in the indiscriminate firing by the ultras. The terrorists, armed with automatic weapons, took them unawares in the pastures where they were camping for grazing their cattle. However, the VDC members retaliated by returning the fire, but their outdated weapons did not match those of the terrorists. The ultras made a retreat because of the resistance put up by the VDC members. The village defence council members and other residents of the village, including women, had been bravely chasing away the terrorists from their village whenever they tried to approach them. The men and women of the village had been trained by the army in handling weapons. But they were attacked when they were asleep in their tents. Reports said the terrorists dragged them out and fired indiscriminately in the open. Some of the villagers managed to escape with injuries. A spokesman of the Army said taking advantage of the bad weather, about 10 terrorists attacked the pasture near the Marrah village where about 60 to 70 villagers were camping with their cattle. The VDC members returned the fire and fought valiantly, firing about 350 rounds to save the villagers. The terrorists were after their blood since August 15, when the villagers hoisted the national flag. They attacked the village about a month ago. But they were chased away by the men and women who opened fire at them. 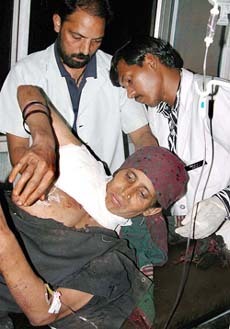 Last night’s attack comes just a few days after Doordarshan telecast a report about the bravery of these villagers in its programme “Kashmirnama”. The programme also highlighted the development works the villagers had undertaken with the help of the Army and the civil administration. Among those killed were Mohammad Farooq (25) and his two sons, Niaz Ahmed (8) and Imtiaz Ahmed (4). Lal Hussain (75) and his daughter Parveen Akhtar (12) fell to the bullets of the terrorists while they tried to flee from there. Gulzar Hussain (25) and his un-named three-year-old son were riddled with bullets, while his wife, Rashida Bi (20) was in hospital with critical injuries. The ultras did not spare even elderly persons and shot dead Ali Mohammad (80) and Noor Mohammad (75). Others killed are, Nazakat Hussain (14), Faiz Hussain (50) and Mir Jaan (25). The Army and the police have launched a massive search in the area. The injured have been airlifted here for treatment in the medical college hospital. Those injured are, Gulab Din (80) and his son Abdul Gani (30), Ashwara Bi (60), her husband Ali Mohammad was among those killed, Shamshad Akhtar (25), Sabza Bi (30), Shehnaz Akhtar (8), Rashida Bi (20) and Shabakar Hussain (10). Except the children, all male members killed and injured by terrorists were members of the VDC. The village is situated just near the Hillkaka area which the Army had claimed it had cleared of terrorists. 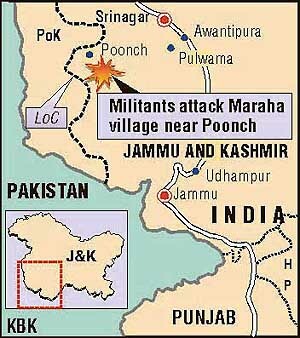 The entire area is considered the launching pad of terrorists when they enter India from Pakistan occupied Kashmir (PoK). The Army had recently completed “Operation Sarapvinash” to eliminate the ultras hiding in the forests in and around Hillkaka. Meanwhile, Mr Bhim Singh, chairman of the Panthers Party, today met the Home Minister, Mr Shivraj Patil, at Delhi and sought his intervention for the protection of lives of innocent persons in J&K. In a strong reaction, Mr Chaman Lal Gupta, former Minister of State for Defence, expressed anguish over the killing of the railway engineer and innocent persons near Surankot. He said the soft policy of the Mufti government towards the terrorists had resulted in escalation of violence in the state.